I’m not writing an informative article about the danger of grains, well not today anyway. I’ve noticed that I don’t like doing things the way most people do them. Is this some element of my stubborn character, something I will grow out of or am I just trying to stand out? I don’t feel like it’s about anyone else so much as it’s about me. Whenever I’ve tried to go with the grain, follow the crowd, I end up just feeling so hopelessly lost and disappointed, like is this really it? What’s the meaning to us all being here, or me being here, am I the only one who cares? Sometimes I want to jump around and sing musical songs in tube trains because I cannot comprehend why everyone is so diabolically normal, content and introverted. I’ve never been a London girl, I’ve thought about it and come close, but there’s something about the place that makes me rush, I’m constantly running and pushing, I guess because everyone else is. I went to millennium Bridge with one of my wonderful filmmaker friends and did what we usually do ~ something to make people think, stop, laugh, be embarrassed on our behalf or maybe just fall over me. I lay out my mat and I did my usual Yoga Practice, started with some breathing, flowed through my sun salutations and moved through the postures that my body was calling for today, and then I lay there in shavasana on my back like a corpse and relaxed (as pictured above). Putting my practice out there into the world, in a busy place full of suits and tourists was pretty surreal. It’s my own baby, my ritual, IT’S MINE, but then suddenly it became their’s too, I wasn’t sure how I felt about that. After a while I stopped noticing that people were there, or catching what people said as they walked by. I was the feature of a fair few instagram’s and curious questions, my favourite from a little girl who asked “Mummy, why is that girl lying there?” to which she replied “I think she’s just resting“, the girl was dissatisfied with that and said “But why’s she resting there?”, that question went unanswered. I’m sure that this was going through a fair few people’s mind if not all as they walked past, even if they did understand or recognise what I was doing, why had I chosen to do it there, in the way of their busy schedule. I was doing it there because I thought it would be a wonderful contrast, me focusing on my breathing and moving through my Yoga practice and everyone else in a hurry to cross over the bridge, to get to whatever awaited them on the other side. Lying there at the end I’ve never felt so much like I am against the grain, I’m trying to fight back against whatever it is that everyone else is doing, not just for the sake of it. I’ve just got so many questions, I’m still like I child and I want to know why you’re doing what your doing, why there, what’s the purpose? I had a wonderful time, and thank my talented friend for taking this adventure with me. When the footage is put together it will be released on to this blog and you can think about which person you want to be, the one rushing to a meeting or the one lying on the bridge watching your breath. Do you ever feel conflicted by social norm and convention? 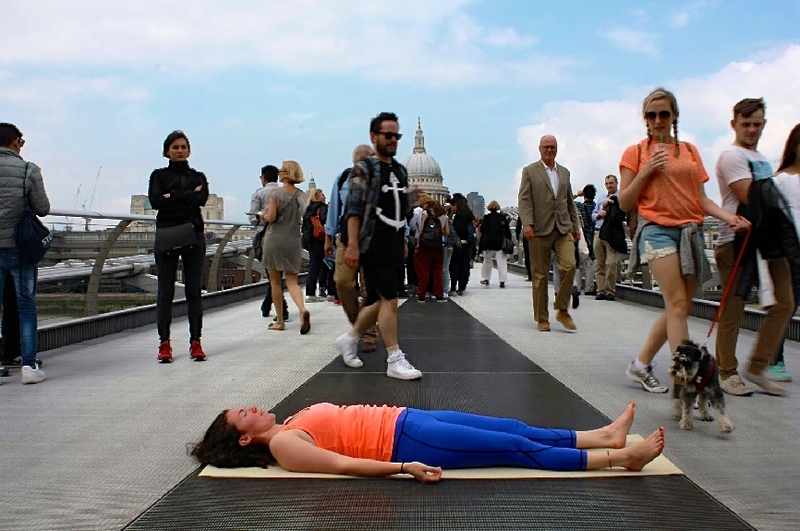 Have you ever lay on a bridge or done some other form of planking David Blane performance art?